alaTest ha raccolto ed analizzato 75 recensioni su Philips BT5262. La media della valutazione per questo prodotto è 4.6/5, confrontata con la media della valutazione di 4.3/5 per altri prodotti. Abbiamo analizzato differenti valutazioni di esperti ed utenti, età del prodotto ed altri elementi. A confronto con altri prodotti, Philips BT5262 ha ottenuto un alaScore™ complessivo di 87/100 = qualità Molto buono.
" Happy with this product "
" My husband decided to grow a beard so I bought him this, checked a few & this one seemed to have the best reviews. My husband said it's great & would definitely recommend it! " " Brought this as a gift and he said this was very easy to use with all the different settings in there. Would definitely recommend. " " Excellent well made & the battery lasts a long time on a single charge. " 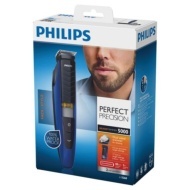 Philips BT5262 Precision Stubble Beard Trimmer.
" Great product, very easy to useq "
" The perfect trimmer for beard and body in my opinion! " " It is an amazing trimmer. I do have some facial hair which needs trimmer every now and then. This trimmer works perfectly well to keep that in good shape. I would highly recommend this product to anyone who is looking to buy a beard trimmer. " " Quick charge Good shaver "
" Good machine good price "